Lean Startup Methodology (LSM) proposes that the creation of a product or service should be done through an iterative, end-user driven process. A hospital-based startup incubator (HBSI) is no different from any other product or service in that regard. The application of LSM allows for rapid, low cost, and scientific validation of the value of a HBSI. The following case study applies LSM to the HBSI as a product of innovation. The first step of LSM is identifying a vision followed by a series of iterative tests to validate or invalidate the strategies to achieve that vision. My vision for improving health for vulnerable populations is value optimization of hospital expertise and narrowing the gap between perceived problems for patients, providers, and payers and the proposed solutions to those problems. 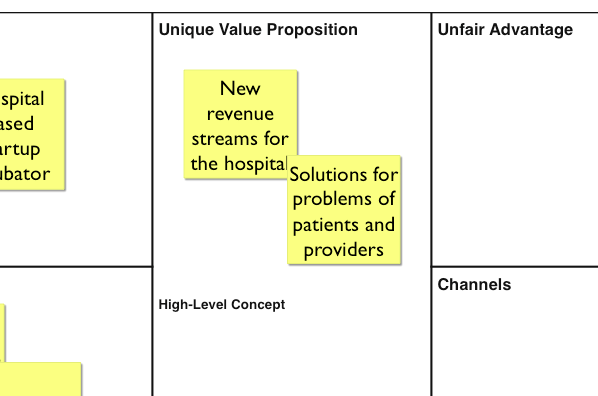 The proposed strategy for value optimization of hospital expertise and narrowing the gap between perceived problems and their solutions is the creation of a HBSI. As with any strategy, it is useful to explore analogs and antilogs to this strategy. Analogs are similar approaches that were successful at solving a similar problem. One analog is health-IT startup incubators. 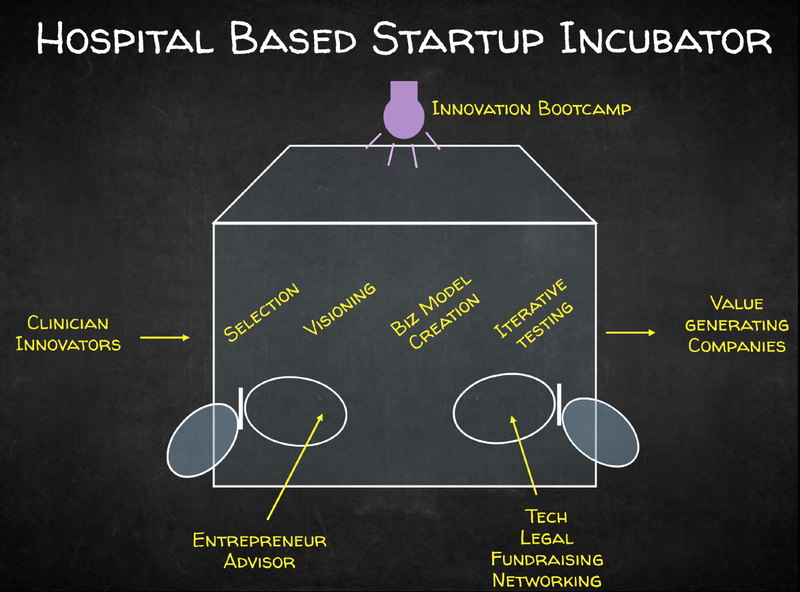 The California Health Foundation recently conducted a thorough review of these incubators. A major weakness of the entire health incubator movement is its nascence and consequently lack of proof of worth. Success of these incubators was largely measured by the number of investment dollars. But investment dollars do not necessarily correlate with profit generation for investors nor improved outcomes for patients. Other analogs include the investment vehicles that have been created at major academic medical centers and health systems including Mayo Clinic, Cleveland clinic, Kaiser Permanente, and Geissenger Health System. Each of these health centers have their own mechanism for funding clinical innovation, but they lack a robust incubation function. 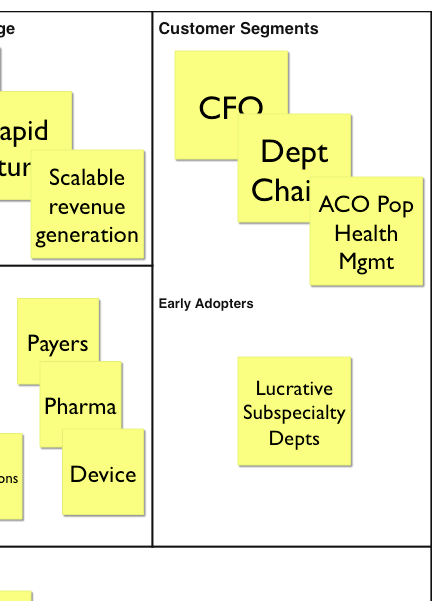 Learning from these analogs, the combination of best practices from health-IT incubators with the movement by hospitals to invest in innovation can inform the design of future HBSIs. Antilogs are similar approaches that were unsuccessful at solving a similar problem. Traditional research and QI are hospital-based approaches to improve health directly or indirectly. Research is a very expensive and time-consuming approach to generating knowledge, which does not directly solve problems for patients or providers. QI is a fast and inexpensive process of improving care, but it does not create commercial value directly. And its validation is through clinical outcomes rather than willingness to purchase from an end user. Both research and QI fail to optimize the potential value of hospitals because the talents of hospital employees remain largely untapped. 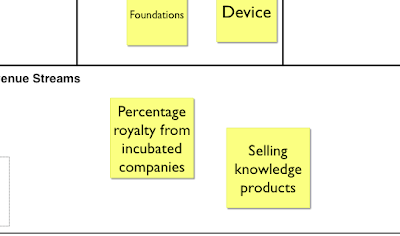 Informed by the analogs and antilogs, the next step in testing a HBSI for value is to lay out the business model. The basic elements of a business model are organized in a useful tool called the lean canvas. 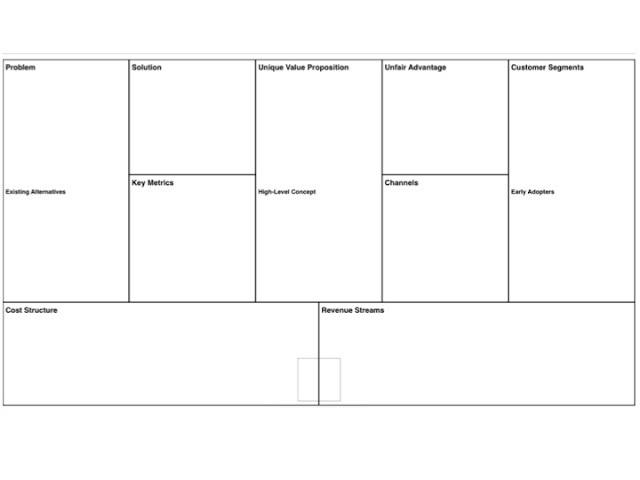 We will use the canvas to organize our experiments to identify and eliminate risk in the business model. It can be helpful to start with thinking about a business model by identifying who has problems that may benefit from your solution. The Chief Financial Officers (CFOs) of hospitals are a good starting point when addressing issues pertaining to revenue generation for hospitals. Department chairman have similar pain points because individual departments with the hospital are microsystems with own budgets and own needs for improving bottom and top lines. Similarly, population health managers can be a customer segment, particularly if the hospital is part of an Accountable Care Organization (ACO) or some other readmission risk-baring organization. A particular subset of customer that will test an innovation at its earliest stages just to be at the cutting edge of new technology is called the Early Adopter. 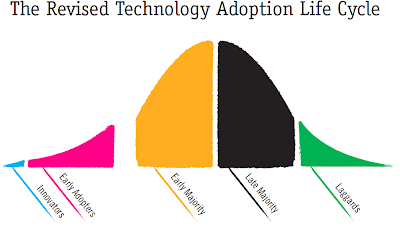 Early adopters of innovations that address budgetary issues may include departments that are well capitalized and looking to invest in ways to further grow their revenue. Although their time of affluence may be running out, for now at least, departments that perform a high volume of procedures are more likely to have discretionary budgets for innovation. Some specific examples include departments of orthopedics, dermatology, urology, and cardiology. One of the major problems faced by CFOs include steadily shrinking reimbursement from payers because financial incentives are moving toward pay-for-performance rather than fee-for-service models. This shift will result in more care transitioning into the community and away from hospitals. Another problem faced by the hospital CFO is the overreliance on revenue generated from charging overhead on research grants. Federal research dollars are fluctuant and currently very scarce. Although premier institutions with strong academic reputations have an advantage in attracting research funding, their competitive advantage is unlikely to overcome the revenue contracture due to cost-cutting programs from the Affordable Care Act (ACA). Additionally, non-elite academic medical centers and non-academic medical centers can not rely on those research revenue streams and require new infusions of cash to remain commercially viable. The current solutions for these problems include cutting non-essential clinical services and revenue generation from royalties from licensing pharmaceutical and device technology. These alternatives are suboptimal. Cutting clinical services can impact quality of care. And royalties from pharmaceuticals and devices are static or diminishing streams of revenue with limited growth potential. Revenue from device innovation will be particularly limited because of stifling effect on innovation of a recent 10% tax on device manufacturers as part of the ACA. The proposed solution to these problems is a HBSI to cultivate the raw insights of hospital employees to create commercial and social value. Key metrics are the measures that gauge the success of an innovation at creating value for the end user. In the case of a HBSI solving problems for CFOs, some measures of success may include 1) revenue generated from creation of a service or product, 2) patient outcomes achieved, or 3) new patient recruitment to hospital, among others. A value proposition is the hypothesized value that a solution will bring to a customer for solving their problem. The value proposition of a HBSI is the cultivation of innovations that can be commercialized leading to de novo revenue streams for the hospital and solutions for problems of patients and providers. 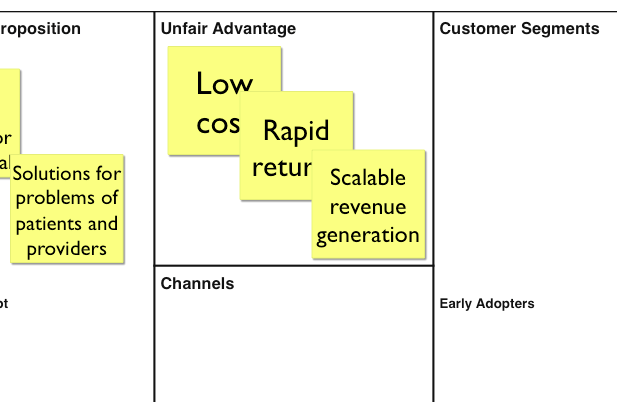 The competitive advantage is the aspect of a product or service that makes it a uniquely better solution than current alternatives. In the case of a HBSI, the major alternative revenue streams include diminishing reimbursement for clinical care, stagnant research grants, and plateaued royalties from licensing drug or device intellectual property (IP). The competitive advantage of a HBSI relative to the other approaches is that it is a low cost, rapid return, scalable approach to revenue generation that can be employed by any hospital regardless of their prestigious reputation or resources. 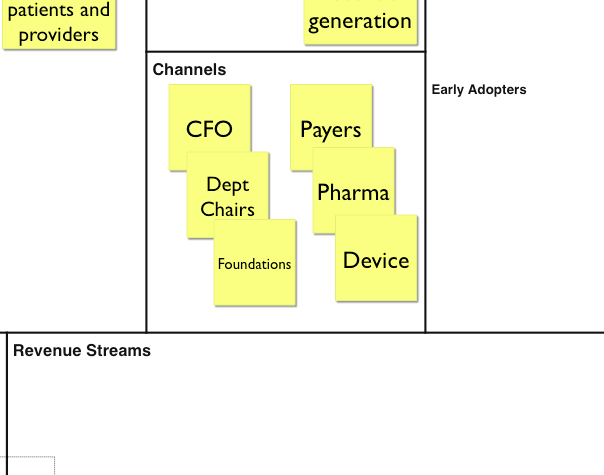 Channels are the routes of distributing an innovation. The channels for distributing a HBSI include the office of the CFO, in which case the CFO would fund or facilitate the implementation of a HBSI. Similarly, the offices of department chairman can similarly serve as the conduit for hosting a HBSI. Distribution channels can also originate outside of the hospital. For example, a foundation or non-profit with the capacity for hosting and implementing healthcare delivery projects could sponsor and host a HBSI within a hospital. Similarly, industry sponsors could leverage their core pharmaceutical or device expertise to facilitate the deployment of a HBSI. An interesting recent development that could make the latter a particularly mutually beneficial distribution channel is the increasing importance of "big data." Everyone from mobile data carriers to payers to “pharma plus” companies are realizing the potential competitive advantage gained from big data insights. Thus, in addition to conferring content expertise, industry sponsors may also be incentivized to make substantial cash investment in an HBSI. This precedent has been set in the health IT incubator community with formal sponsorship from GE of a class of entrepreneurs in the Startup Health Incubator. The major costs of a HBSI include a small staff and small-scale technology development. Many costs can be defrayed through partnerships with business, technology, legal, and content experts in exchange for lead generation, brand strengthening, or other secondary gains. Furthermore, tech development is generally a minimal cost because a large amount of validation can be done with mock-ups, prototypes, and vaporware that are inexpensive but convey enough functionality to solicit feedback from customers. When incubated companies are prepared to begin scaling, they can do so outside of the hospital with external investment to build talent and technology. Consequently, hospitals would not need to build much capacity to run these companies internally. Any revenue generated from the product or service incubated by a HBSI would inherently share royalties with the hospital and/or department where the innovation originated. However, hospital culture needs to change to be more embracing of smaller ownership over its innovations in order to allow these innovations to scale. An unfortunate legacy of the pharmaceutical and device era is that intellectual property (IP) policy of hospitals has traditionally been to take a very large stake of ownership in innovation. This was tolerable when IP could be licensed to a device or drug company, get absorbed into the R&D machinery of that company, and then the actual device or drug would be developed outside of the hospital. In the HBSI model, much if not most of the product or service validation would occur within the hospital. Upon scaling beyond the hospital, the intervention becomes its own company with its own fundraising needs, and thus its own need for mitigating financing risk. If the antiquated IP policies persist, then startups will be incapable of raising external funding because investors will be reluctant to invest into an overly diluted equity pool. Hospitals should create IP policies that facilitate small hospital ownership to enable large value creation rather than large ownership of technologies that are value-less. The typical types of risk to a business model include product risk, customer risk, and market risk. 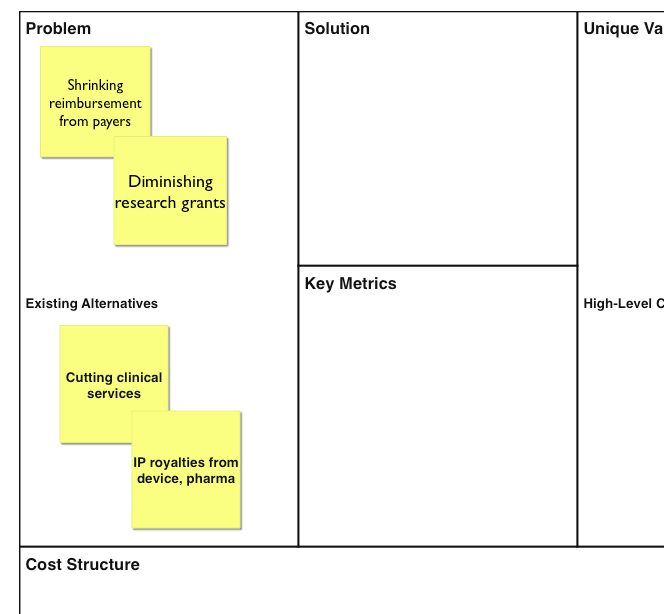 The process of prioritizing risk is an opportunity to showcase user-led innovation applied to health care. User led innovation is a concept developed by Eric von Hippel at MIT and it involves the process of innovation by immediate consumers rather than by suppliers or producers of that innovation. In healthcare, clinician-led innovation is very similar and simply means that clinician-scientists are the source of innovation because of their exposure to and struggle with the day-to-day problems of their work. Clinician-led innovation enables for optimization of risk identification because clinicians have the greatest insight into their own pain points. 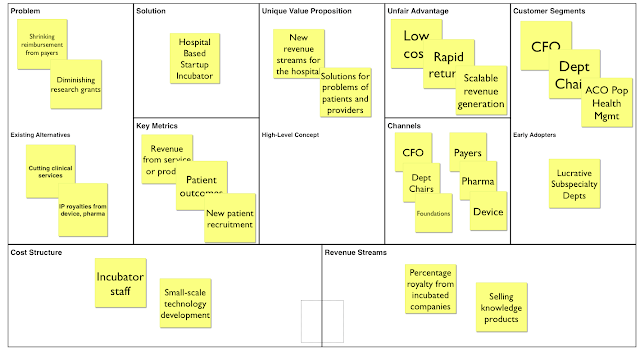 In the case of a HBSI solving a revenue problem for a hospital CFO, it would be optimal for this to be a CFO-led innovation. But clinician-entrepreneurs with insights into the financing of hospitals and healthcare are a good proxy for understanding hospital CFO pain points. In my opinion, I believe that product risk is the largest of the three risks, so I will briefly summarize customer and market risk as they pertain to the creation of an incubator and spend the majority of the risk discussion focused on product risk. Customer risk is the uncertainty about whether there is a customer who perceives a problem big enough to make it worth solving and paying for the solution to that problem. Most hospital CFOs likely feel the pressures of Medicare cuts to readmission reimbursement and the shift away from fee-for-service. Consequently, they are probably interested in improving their top and bottom lines. Product risk is the uncertainty about whether something can be built that other people will want. This is the largest risk because a hospital based startup incubator has never been built and we do not have any empiric evidence that one can be built and made to achieve its goal. In order to mitigate product risk, a series of experiments will need to be designed to mitigate that risk. 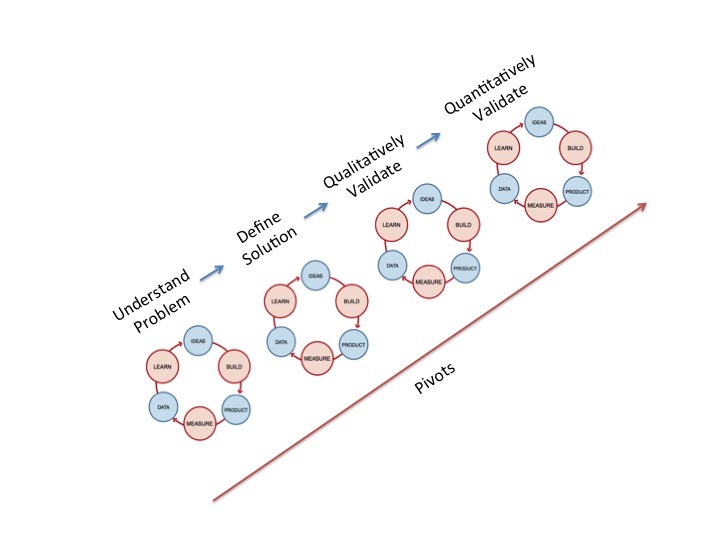 The tests will run along 4 domains: understanding the problem, defining the solution, qualitatively validating, and quantitatively validating. Within each of these domains, we will design one or more experiments that will follow the following 3 steps: build, measure, and learn (BML). 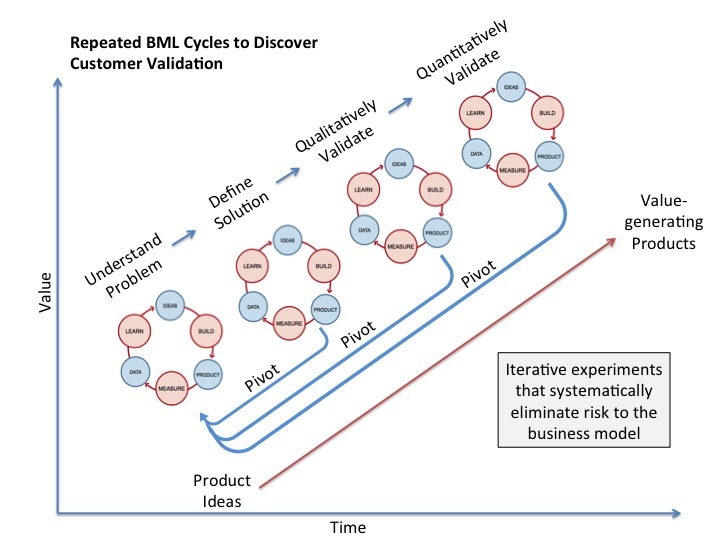 Through a series of iterative BML cycles, we will validate or invalidate the customer need for an incubator. We have already made an educated guess about the problems faced by the CFO in the “problem” section of the lean canvas. We now need to validate these hypotheses. The test we will build is to actually ask the hospital CFO if in fact the problems we identified are real problems for her. The problems will need to be prioritized. And beyond our hypothesized problems, we will need to ask the CFO if there are other problems that we have not identified that she feels are particularly pressing. If we validate our hypotheses about the CFO’s pain points, we will need to further define our solution by exploring if our proposed solutions would theoretically solve the CFOs problems. This test can and should be run simultaneously with the same interview in which we learn about the problem. 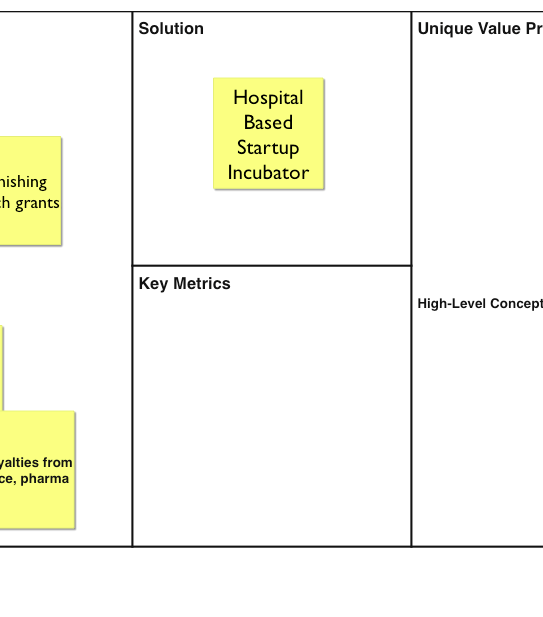 A simple slide deck of the incubator idea is likely sufficient to convey the potential value of the HBSI. As with any product or service at this stage of testing, it is import to ask if the CFO is willing to pay for the HBSI. Payment may be in the form of dollars. Payment can also be willingness to dedicate another scarce resource: time and/or attention. It is essential to elicit a concrete answer. If the CFO definitively says that she is willing to commit cash, than you have validated the need for an incubator and you have achieved problem-solution fit and done so very inexpensively. If the CFO gives a resounding no, this is also very useful information, and your test has successfully invalidated your hypothesis. At this point, it is important to step back and form a different hypothesis, or pivot, with regard to the current incubator strategy. 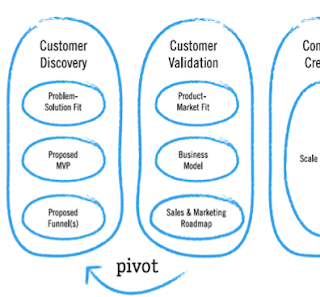 A pivot may include reframing the incubator value proposition or exploring different customers such as department heads. If the CFO is equivocal, it is important to redesign the experiment to get more clarity from the end customer. It can be very enticing to try to proceed based on the assumption that the CFO will perceive your solution’s value the way that you do. But without “leaving the office” and actually asking her directly and getting confirmation, inaccurate assumptions may guide a long series of tests that were invalid before they were even conducted. The value of LSM is the rigorous adherence to end-user validation. You do not have to achieve statistical significance with feedback from the CFO, but you do need to get direct confirmation that your assumptions about value are correct in order to actually create that value. If the CFO validates the value of a HBSI, or confirms problem-solution fit, then it is time to move to the next step of eliminating product risk, which is building the minimum viable product (MVP). The MVP is the product with the fewest number of features needed to get users to pay in some form of a scarce resource. With the creation of the MVP, we now move into the qualitative validation portion of eliminating product risk. 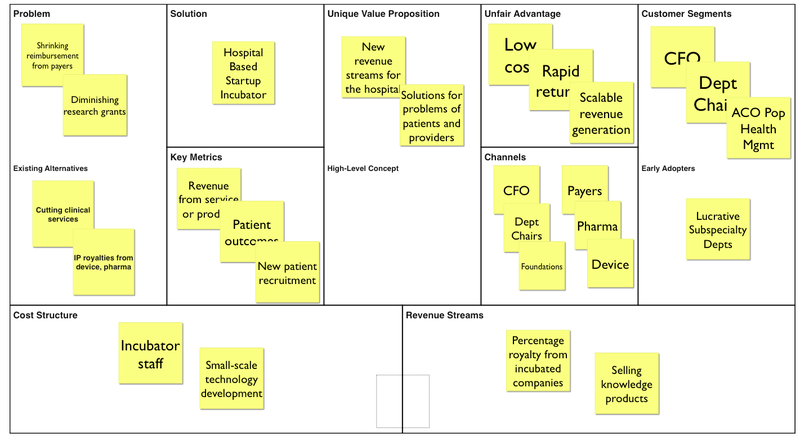 The MVP for an incubator includes the following bare minimum functions in order to transform a clinician-innovator's idea into a product or service that creates value. In the early stages of an incubator, the 3 minimal requisite components for the incubator include the clinician-innovator, and entrepreneur advisor, and a local sandbox for running tests. Hospitals are by default the sandbox. Entrepreneur advisors can be sourced internally or externally to a hospital. And the clinician innovator will likely come from a self-selecting group of scientists that have identified themselves as having an interest in innovation. As the incubator matures, it will require access to the following functions: technology development, legal guidance, fundraising, and networking with other innovators. Once an entrepreneur advisor has been identified, the process of incubation can begin. The first step is vetting ideas for incubation. 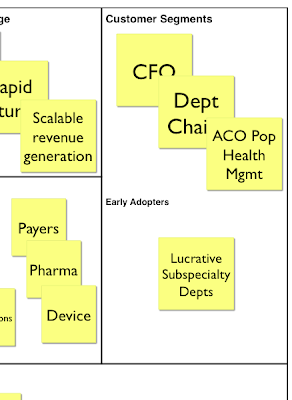 Idea selection goes hand in hand with selecting clinician-innovators. The innovator selection process should prioritize passion and willingness to learn over most other criteria. For the sake of expediting value discovery, targeting innovations that will face the fewest regulatory barriers is a good place to start. So, software applications will likely be validated faster than drugs or devices. Also, business-to-consumer (B2C) products tend to be easier to get feedback on than business-to-business (B2B). So an app being sold directly to patients or providers would be easier to test for value than an app designed for insurance companies. Clinician-innovators typically do not have experience starting and operating a company. 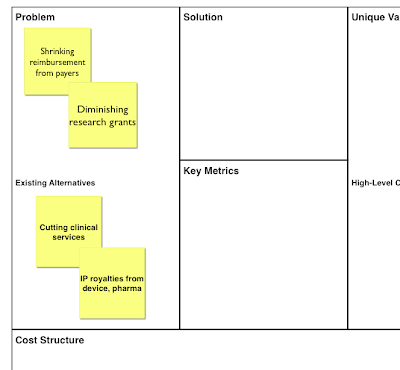 LSM facilitates efficient discovery of value of a proposed innovation. Although it is less familiar to scientists than research or QI, LSM is grounded in the scientific method and is not difficult to learn. In order to get the clinician-innovators speaking the same language as the entrepreneurs, they need to go through a LSM bootcamp. The bootcamp would be partly didactic and mostly case-based exploration of LSM principles. The bootcamp would also set some basic expectations for the LSM experience, such as not expecting to get rich, since most startup companies fail. Once the clinician-innovator is familiar with the basic principles of innovation, the visioning stage can begin. 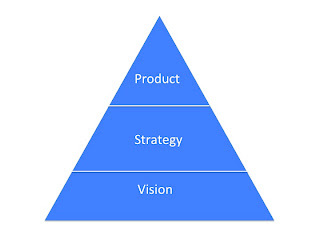 This stage includes the same steps as we went through with the HBSI as a product above: 1) identify a clear vision, 2) propose several strategies to achieve that vision, and 3) design experiments that will lead to the creation of a product to execute the strategy. It is possible that the original product idea may not end up being the chosen strategy to test. As the first innovation is passing through the bootstrapped incubator, it will be important to confirm if the incubator is creating the value to the CFO that you intended to create. In other words, the incubator as a product itself will need to validate its own product-market fit. Validation of product-market fit will occur when the CFO is actually paying for your product in the form of money, time, attention, or all of the above. As product-market fit is being achieved, it is appropriate to formalize the entity of the incubator if this has not been done already. The “payment” from the CFO would likely be used to reinforce or create a dedicated incubator function within the hospital. And the structure of the incubator should reflect an augmented version of the elements outlined in the “Incubator Components” section above. Some of the functions may remain within the hospital. Other functions may need to be outsourced. 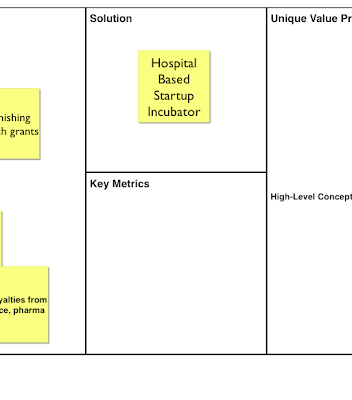 Further recommendations about best practices for scaling an incubator will be explored in a later post. 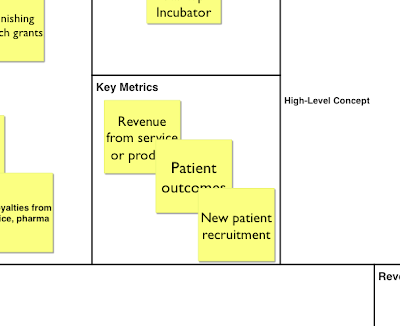 It will be important to assess the outcomes of an incubator based on the metrics outlined above. It will also be important to explore how the incubator can be scaled to other users inside and outside the hospital. Like medical specialties, a HBSI can be subspecialized to achieve innovation efficiency within a specific domain. Tertiary academic medical centers may be very well suited for this type of incubator specialization because they are already structured along sub-specialty areas with their own channels of cultivating academic progress. That same machinery can be used to cultivate commercially viable clinical innovation. LSM can be used to rapidly, inexpensively, and scientifically validate the value of a HBSI to a hospital CFO in solving crucial budgetary problems. 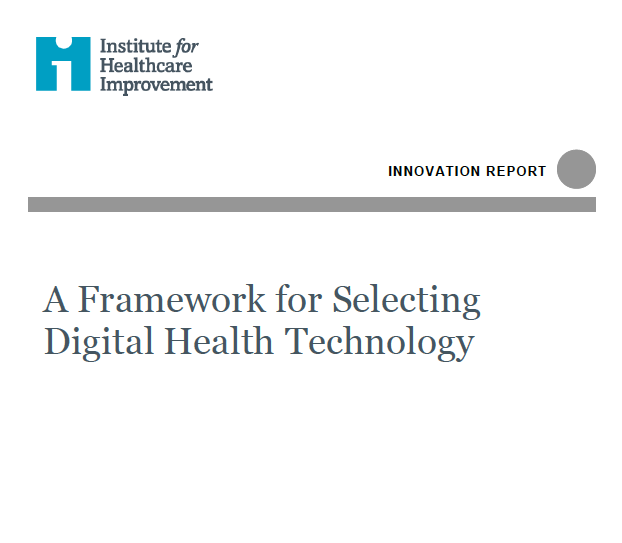 If the value of this strategy is validated, then the HBSI will be faced with a unique set of risks to hospital-based incubation. In addition to the previously mentioned legal and financing risk, other risks that will be important to mitigate include culture risk, regulatory risk, patient protection risk, and education risk. Further exploration of approaches to mitigate these forms of risk will be important to facilitate rapid value optimization through a HBSI. (2) Maurya A. Running Lean: Iterate from Plan A to a Plan that Works. 2012. (4) Cooper B & Vlaskovits B. The Entrepreneurs Guide to Customer Development. 2011.